BOSTON — As a people, Russians have not often been associated with great senses of humor. Yakov Smirnoff doesn’t count. And avant-garde humor — albeit black humor that may not be transparent at first glance — aimed at the regime of a notorious dictator such as Josef Stalin was a good way to get a one-way ticket to the wilds of Siberia. So it’s not really a surprise that much of the work of Daniil Kharms did not surface until long after his mysterious death. In 1941 — at a time when 1,000 people a day were being executed — the superintendent of his flat called him down in his slippers “for a few minutes” and he was arrested by officials. He was afterward sent to a prison psychiatric hospital. While he was in the hospital, a bomb damaged his home, and Kharms’ wife called an artist friend, who hauled away his papers on a sled through the snow to safety. Kharms died from starvation in 1942 in the prison hospital and his papers never emerged until the 1970’s. 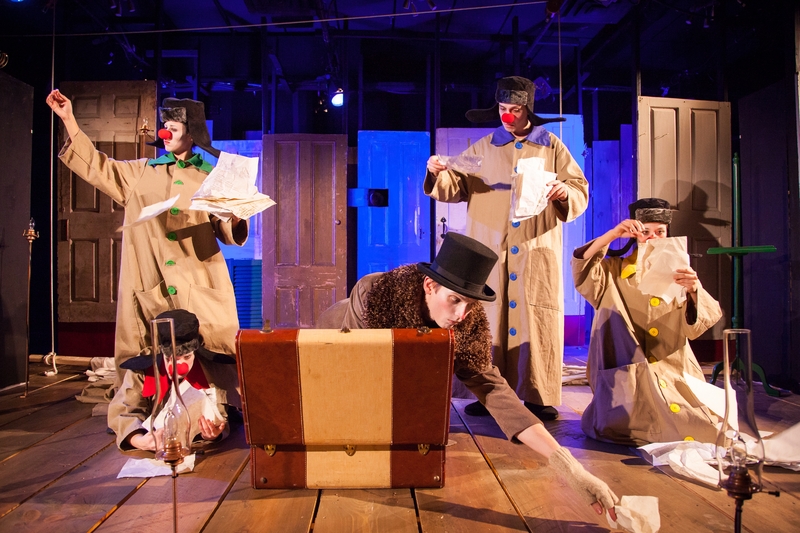 The Boston-based local theater group imaginary beasts has compiled selections of his micro-prose, short plays and poetry into “Knock: The Danil Kharms Project,” now at the Plaza Black Box Theatre at the Boston Center for the Arts on Tremont Street through Saturday, Oct. 18. Matthew Woods directed an adaptation by Matthew McMahon based on translations of Kharms’ work by Irina Yakubovskaya. The troupe’s previous efforts have gained it a reputation for originality, with smartly-produced production values, and an infectious enthusiasm for the work at hand that spills over into their performances. Kharms’ Soviet Union is a broken place, and the characters and their situations reflect it. Stories will seemingly end in space only to be randomly picked up again. A romantic couple will disappear suddenly in a chilling manner. Fools — meant to be the Soviet oppressors of artists such as Kharms — follow a sled with pages leaking from a suitcase, a seeming replication of how Kharms’ papers were saved by the friend who took them on a sled to safety. Molly Kimmerling is Baboushka, a laughing old woman who bullies an author. Is Fedya (William Schuller) whose writing is going nowhere, a stand-in for Kharms himself? A 10-person company performs this true ensemble piece, and it depends on the interlocking skills of each performer. sound design by Chris Larson with period Russian music, and effective use of such tools as a slide whistle which add immeasurably to the authentic atmosphere of the piece. The largely backlit Lighting by Christoper Bocchiaro is also effective. There is no linear story or defined plot to speak us, but there are many moments that are funny, touching, or simply chilling. Imaginary beasts has already garnered a reputation for original, ambitious and daring work, and “Knock!“ is no different.